If you take a look at ancient medicine and healing practices from around the world, you will find some absolutely amazing sounding remedies, for just about any malady and affliction. In the 16th century, Chinese Pharmacologist Li Shizen, came across a remarkable form of medicine practiced in Arabia. 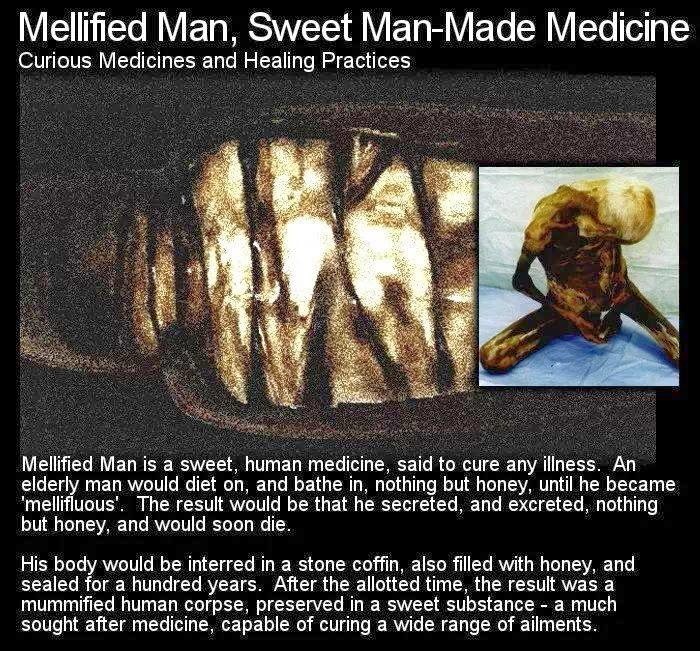 Mellified Man (or Mizen, Miziren) is a human mummy confection, that was said to be capable of curing any ailment. Just about every part of the process, in making this medicine, would be seen as quite strange today. The process begins when an elderly man volunteers his body, and the rest of his life to the procedure. From this point on, the man is fed nothing but honey, drinks nothing but honey and bathes in nothing but honey. After a period of time on this diet, he will secrete and excrete nothing but the sweet substance. He is now 'mellifluous' meaning 'like honey' and death will shortly follow. His body will be interred into a stone coffin, where he will be totally submerged in honey. The coffin will be sealed with an inscription giving the month and year added. After a full century has passed, the coffin is opened and what it contains is nothing but honey and a mummified corpse. He is now Mizen; a honey person. Honey has antibacterial properties, so the body has been completely preserved. The medicinal confectionery would be sold, and could fetch very high prices. It was prized for its curative properties, and could heal just about any affliction. It would be either rubbed into the affected area or taken orally. Orally was the best method, as legend states it would cure the complaint instantly. Li Shizen does state that his account of the mellified man process comes from a second hand account, so it is not 100% certain whether these details are accurate or took place. Honey has been used as a medicine for thousands of years, as has substances of human origin (urine, breast milk and blood to name a few). Burmese priests have a ritual where they preserve the chiefs of their religious order in coffins filled with honey, but they do not eat the mummified remains. Picture: Artists rendition of a mellified corpse. Inset: A mummified body with a lovely golden hue.